The sermon, offered by the Rev. 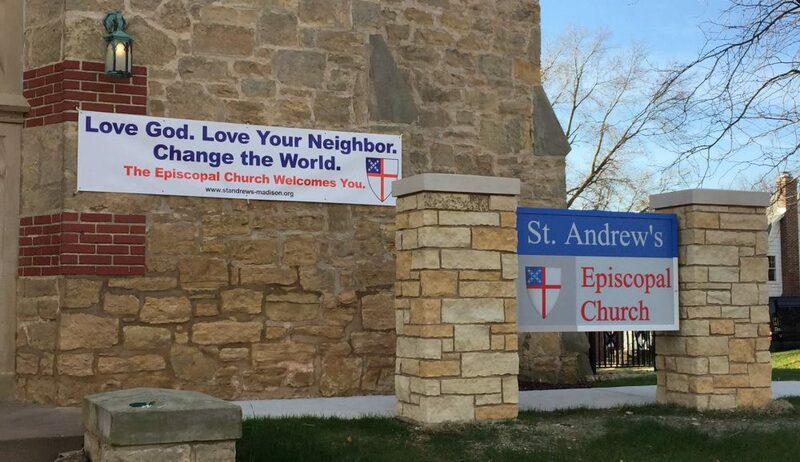 Andy Jones at Saint Andrew’s Episcopal Church on June 3, 2018, is built around the readings for Proper 4, Track 2, in Year B of the Revised Common Lectionary. May the words of my mouth and the meditations of our hearts be always acceptable in your sight, Oh Lord, our strength and our Redeemer. Some legal conflicts get settled in the court of law, some however get settled in the court of public opinion… Sometimes they get settled in both, and the resolution of those trials are different. Here this morning we hear of a legal conflict which is being resolved in a grain field, but it is no less in the court of the public opinion and the court of law than if it were being played out on the evening news and in the Supreme Court today. So we’re wrestling with this case, wondering how Jesus will make his way through this conflict and this challenge, when Mark offers us a second story that’s even a little fuzzier. A man who was born with a withered hand, unable to work, unable to support himself or his family, to participate in the economy… he might has well have been exiled in his own land; is there in the synagogue when Jesus enters on the Sabbath. And the Pharisees are watching to see what he’ll do. Jesus knows what’s in their hearts and he calls the man forward; and then asks the Pharisees is it permissible to heal or to kill, to do good or to do harm on the Sabbath? The Pharisees recognize that the cameras are on them, the nation is watching, and they’re afraid to answer Jesus’s question. That’s because they know, they already understand what Jesus said to them in the grain field. And that is that the Sabbath was made for humankind. Humankind was not made for the Sabbath. It’s not as if the Sabbath and its attendant regulations are some goal in and of themselves. Even here in Deuteronomy we hear that people are supposed to do no work, they’re not allowed to work on the Sabbath, so that they and all of their household, even the aliens sojourning in their land, may have a day of rest. God gives us this commandment not because it accrues some benefit to God for us to obey it, but because it accrues benefit to us! So the Sabbath and all of its attendant regulations are for our benefit not for God’s! That’s the spirit of the law! But in these two challenges that Jesus faces in today’s reading it is the letter of the law it’s being thrown in his face. Clearly, if the Sabbath is made for us, then if you’re hungry you need to eat. And if you have been cast into the margins because you are unable to work, being healed on the Sabbath is in line with the spirit, if not the letter, of the law. Now it’s important, I think, for us to know that biblical scholars believe that the first books of the Torah, including Exodus, and including the book of Deuteronomy, were written down and formalized when the people of Israel were in exile in Babylon. So all of their oral traditions, all of the stories they had been telling about themselves: who they are, and their relationship with God, were codified during that period. They thought that the soul of their nation was at stake. There in Babylon their children were marrying Babylonians. Their traditions and their customs were being ignored. They could feel their very identity beginning to dissipate. And what was worse, the stories they heard from back home said that people had taken over their property, they weren’t worshiping anymore… They were terrified that they were lost. And so they wrote down all of these laws, and rules, and regulations as a way to make themselves distinct from the people around them. In an attempt to save their identity as a people, strict adherence to these laws became incredibly important. But here they are now back at home, in the land, and that strict adherence to the letter of the law is still the rule of the day. They thought that the soul of their nation was at stake when they were in exile in Babylon. What Jesus is telling them in these two passages is that the soul of the nation is still at risk, because we are no longer a nation that’s identified, that’s set apart, by its compassion, and its love for God, and his love for God’s people; no longer a nation ruled by the spirit of the law; laws which are established to uphold everyone; to make sure that the slaves, and the resident aliens, and even the animals get a day of rest; laws that are meant to nourish, and sustain, to make us all whole, and to allow us flourish. In this moment of conflict Jesus is saying we are becoming a nation that is focused on the letter and not the spirit the law. I think that this is a lesson that stands out and rings true across time, and across the waters. Our laws, we are a nation of laws, are designed to hold us all up, to hold us together, to give us an identity as a people. And if God’s laws are all about compassion, and relationship, about nourishment, flourishing, being whole, then the laws of this land need to be focused on those same goals. Again and again in the courts of law, and in the court of public opinion on the evening news, we see the letter of the law being upheld over the spirit of the law. And if Jesus’s heart was grieved at the hardness of heart of the people he confronted in these stories, I shiver to think what his heart is doing in response to the stories that we are seeing on the evening news. Here in this moment of conflict there is a choice to be made. Jesus is threatening the rule and the authority of the most religious people in the land, people who are set up to guide, and to govern, to rule and to make decisions, to interpret, to discern. There is a choice to be made. Will the people follow leaders who are focused the letter of the law, enforcing the strict reading of those texts, or will the people follow leaders whose hearts are focused on the spirit of the law; the spirit that flows from God into each and every one of us; telling us that every person, every one of us, every one of us, is beloved and has value and is worthy of respect; should have what we need to flourish, and to be a whole, and to thrive. Will we follow leaders who are functioning out of a mentality of scarcity and the need to control for fear of losing something, or will we follow leaders who are calling us to a better vision, to a theology and a mentality of abundance, of love, of grace, of sacrificial giving in order that we all might be whole? This morning, buried within this text, there is a question for each and every one of us. The soul of our nation is at stake. Who will we be?